Following each itinerary, I’ve listed some accommodation choice that are convenient to the walk. The Southern Higashiyama District is Kyoto’s most famous and most popular sightseeing district, and for good reason: from Shichijo-dori in the south to Sanjo-dori in the north, it’s one long strip of first-rate sights. The itinerary here is described from south to north, but you could just as easily do it in reverse. It can be done in three or four hours, but if you slow down and eat lunch en route, it could take most of a day. Keep in mind that this area will be packed with people during the cherry blossom season in late March and early April. Start by taking a bus to the Gojozaka bus stop (note that you can also reach this by taking the Keihan Line to Kiyomizu-Gojo Station and walking east [uphill] on Gojo-dori). – From Gojozaka stop, walk up Gojozaka and Chawanzaka lanes to Kiyomizu-dera Temple. Take some time to explore the temple, including the Tainai-Meguri, located in front of the main entrance. – Walk down the scenic Sannen-zaka and Ninnen-zaka lanes. There are plenty of teahouses and restaurants here if you feel like a break. – At the bottom of Ninnen-zaka, turn right and then left into Nene-no-Michi, one of Kyoto’s most scenic streets. Consider a short detour into the lovely Ishibei-Koji lane. Also consider a visit to Kodai-ji Temple, located above Nene-no-Michi (clearly marked). – Follow Nene-no-Michi north (jogging right then left) to reach Maruyama-koen Park. – Enjoy Maruyama-koen Park and then exit the north side of the park and walk to Chion-in Temple. You can explore most the temple grounds for free. Walk up the steps through the impressive San-Mon Gate and be sure to go into the main hall (free). – Leave Chion-in Temple the way you came and turn left (north). A short walk will bring you to Shoren-in Temple (look out for the giant camphor trees out front). I highly recommend paying to enter Shoren-in – it’s one of the real gems of Southern Higashiyama. – Leave Shoren-in Temple and walk north to reach Sanjo-dori. Turning left here will bring you to Higashiyama-Sanjo bus stop. Crossing the street and turning left will bring you to Higashiyama Station, which is on the Tozai Subway Line, which will get you downtown and connects to the Karasuma Subway Line (if you want to get to Kyoto Station). There are a few restaurants near the Sanjo-Jingumichi intersection here where you can grab lunch. Note that if you walk uphill for about 10 minutes, you will find yourself near the start of the Northern Higashiyama Walk outlined below. These two walks can be combined to form a good full-day route. The Northern Higashiyama area is second only to the Southern Higashiyama area as Kyoto’s most popular sightseeing area. In some ways, it’s more pleasant: there’s more greenery and even during busy seasons, it feels less crowded. The route here is described south to north, but you could just as easily do it north to south. It takes three or four hours to do this walk, but if you stop for lunch en route and really take your time, it could take most of a day. Note that the Path of Philosophy area will be very crowded during cherry blossom season in late March and early April. – Start by taking the Tozai Subway Line to Keage Station . You’ll see a brick-lined tunnel entrance under a grass embankment. Walk through this tunnel and continue straight on for about 200 meters, where you will intersect with an automobile road. Turn right here and go through the main gate of Nanzen-ji Temple. – Explore the grounds of Nanzen-ji Temple for a while. At the top (east/uphill) end of the grounds, you will find the Hojo Hall, which contains the Leaping Tiger Dragon. This isn’t my favorite garden in town, and the tranquility is spoiled by an annoying tape loop, but if you won’t have time to see other gardens in Kyoto, consider paying to enter. Also note that there are some interesting subtemples up behind the Hojo Hall (reached by going under the aqueduct and following the stream up into the woods). – Exit the north side of Nanzen-ji Temple complex and take a right, following the road around, past a high school and Eikan-do Temple. After about 200 meters, you will see a sign for the Path of Philosophy (Tetsugaku-no-Michi). Turn right here. – Walk north on the Path of Philosophy. This is the pedestrian path that follows the canal north at the base of the Higashiyama Mountains. – As you near the north end of the Path of Philosophy, you will see a few temples marked off of the path. Consider taking a detour to visit the wonderful (and free) Honen-in Temple. – Continue up the Path of Philosophy until you reach a bridge and a busy temple-approach street lined with shops. Take a right here and you will reach the wildly popular Ginkaku-ji Temple. 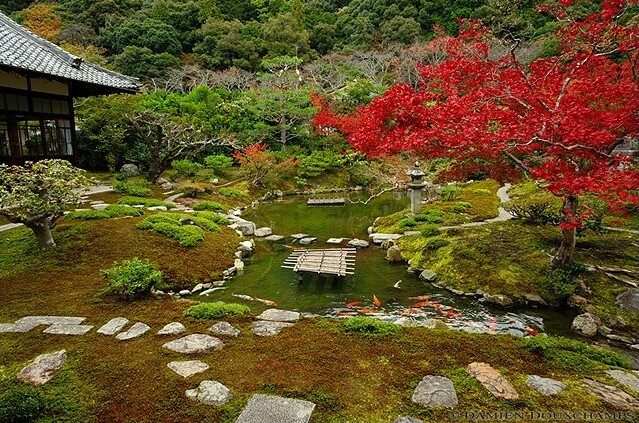 -Visit Ginkaku-ji Temple, being sure to take the footpath at the base of the mountains to the viewpoint over the garden. -Return to the temple approach street and follow Ginkaku-ji Michi (which parallels the canal) west to reach Shirakawa-dori. Cross Shirakawa-dori and you will find Ginkakuji-michi bus stop about 50 meters west on Imadegawa-dori. 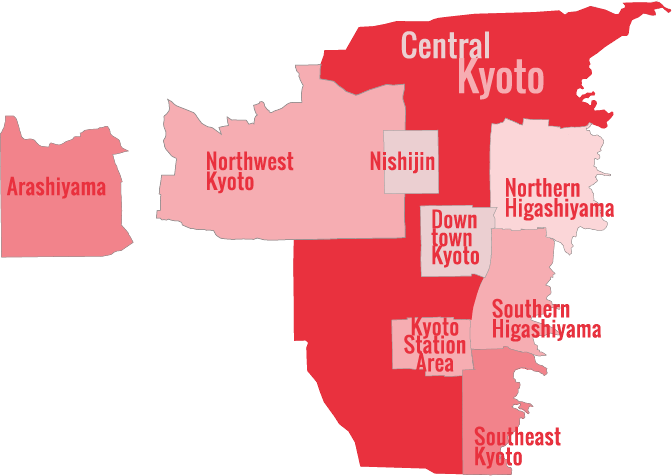 Here, you can catch buses to all parts of Kyoto, including Kyoto Station. 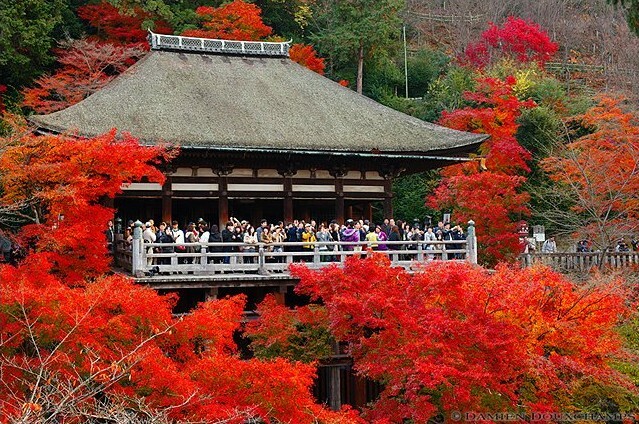 Arashiyama is the next main sightseeing area in Kyoto after Southern Higashiyama and Northern Higashiyama. It’s very popular with Japanese sightseers and it gets crowded in the March/April cherry blossom season and the November fall foliage season. The itinerary here is described from south to north. Keep in mind that there aren’t many places to eat en route, so either eat before starting or bring some snacks. The route takes about four hours to do, but could easily extend to six hours if you take your time. – Get yourself to Arashiyama (see the Arashiyama District page for transport details). – Enter the main gate of the superb Tenryu-ji Temple and explore the temple (both the inside of the hall and the outside garden areas). – Walk uphill and through the garden to reach the north exit of Tenryu-ji Temple. 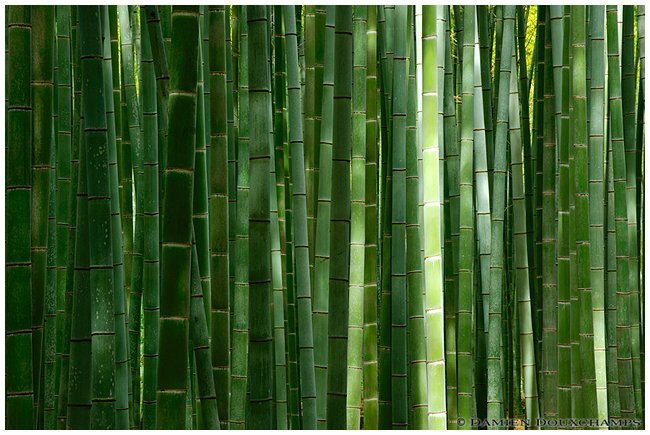 Take a left outside the exit and walk uphill and you will find yourself inside the incredible Arashiyama Bamboo Grove. – Walk uphill through the Arashiyama Bamboo Grove and when you reach the top of the hill and the road, look across the road and to the right a bit and you will see a small hut. This is the ticket booth for the sublime Okochi-Sanso Villa. Pay the admission fee and walk up into the villa grounds. – Take your time exploring Okochi-Sanso Villa and don’t forget to stop in the rest house after exploring the villa to enjoy a cup of matcha tea and a sweet (included in the price of admission, so don’t lose the tea ticket). – Leave Okochi-Sanso Villa and take a left onto the main sightseeing road, heading north. Go downhill and pass a pond on your left. The route here goes past a string of temples: Jojakko-ji Temple, Nison-in Temple, Takiguchi-dera Temple and Gio-ji Temple. Soon after passing Jojakko-ji Temple, you’ll see the quaint thatched-roof Rakushisha Poet’s hut, which belonged to a disciple of the famed haiku poet Matsuo Basho. While it’s tempting to visit every temple on the route, it would take a long time and cost a fair bit of money. Thus, I usually visit only Gio-ji along this stretch. – Visit Gio-ji Temple (you might have to ask someone for directions, as it’s a little difficult to spot). After visiting the temple, return to the main route and continue northwest. – You’ll pass several shops and a few restaurants. After about 250 meters, you’ll see the steps leading up to Adashino-Nembutsu-ji Temple on your left. Consider visiting this temple. – Walk north from Adashino-Nembutsu-ji Temple and you’ll soon get to the bright orange Atago Torii, a lovely Shinto shrine gate. Near here, you’ll see the thatched roof of Ayu Cha Hiranoya, which serves matcha tea and a sweet for Y800. – You can either retrace your stops all the way back to central Arashiyama here, or you can walk up the stone steps on the left, just before the highway overpass, to catch bus No 62 or 72 back to Arashiyama or onward to Kyoto station.